It may be called Snowdon - but for how long will it still have snow? The snow is disappearing from Snowdon, scientists have claimed. A study of the snowline on Wales' icon mountain has found its winter cap has retreated over the past 10 years. The area covered in snow has decreased from 56,000 sq metres in the winter of 1994/5 to little more than 25,000 sq metres for the past three winters. Dr Jeremy Williams, of Bangor University, said: "This data confirms what many gardeners believe - winters are not as hard as they used to be." The data collected by experts from the university suggests that a white Christmas on Snowdon - the tallest mountain in England and Wales - may one day become no more than a memory. The figures indicated that this winter Snowdon is on track to have less snow than any of the last 10 years. The results appear to back the growing body of evidence to support climate change. Temperature studies carried out on the slopes of Snowdon as part of the UK-wide Environmental Change Network have helped record a 1C rise in UK temperatures in the past 25 years. The work was carried out by university in conjunction with the Countryside Council for Wales. It found that the mountains of Snowdonia can have a 9-month winter and a 3-month summer, as snow may fall on any day between early September and late May. 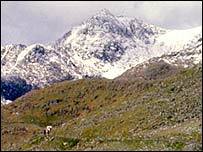 The snowline on the hills of Snowdonia is recorded daily over the nine winter months, as one of the key indicators of Welsh climate. Snow cover on these mountains has been steadily declining over the past ten years apart from 2001. Dr Williams said: "What we have found is that it is not so cold as it used to be. "Minimum temperatures do not plunge as low as they used to which means that the range of temperatures we experience has decreased. "And if recent trends continue a white Christmas in Wales could certainly be a thing of the past." Simon Bareham CCW Senior Pollution and Climate Change Adviser said: "Species unique to the areas such as the Snowdon Lily could be lost with only very small climate changes. "But there could far more serious consequences if temperatures continue to rise unchecked, as indicated in the latest report by the Met Office Hadley Centre. "The future climate of our planet lies at a major crossroads. "Our impact may be small in global terms but we can show that a concerted effort could ensure that the gloomy predictions for the future based on current lifestyles and economies do not become what would be a pretty unpalatable reality."